Floppies or CD-ROM; see run in DOSBox (retail). Pre-packaged with DOSBox. Includes Ultima Underworld: The Stygian Abyss. Not available in some regions. 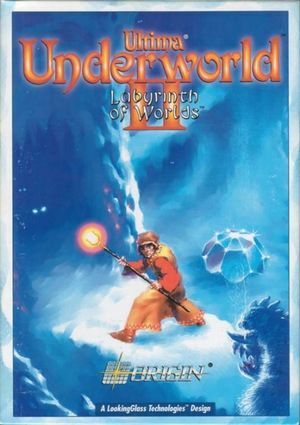 The Ultima Underworld 2 Patch is needed for floppy disk versions. The CD-ROM and GOG.com versions are already fully patched. An unofficial General MIDI patch is available here. To run correctly in DOSBox change cycles=auto to cycles=max. The SAVE1, SAVE2, SAVE3 and SAVE4 folders are save slots I-IV. SAVE0 is temporary storage, not a save. In-game settings are stored in each save rather than shared. An alternate shades.dat is available here which will increase the overall brightness of the game without destroying it's atmosphere. Use it if you feel the game is too dark. To avoid mouse lag, set "sensitivity=200"
Everything is text-only after the opening cutscene. French, German, Korean and Polish retail versions only have the manuals translated; the game itself is still in English. The GOG.com version's sound is incorrectly configured by default, resulting in misplaced effects such as piano sounds for footsteps. Go to DATA in the installation folder. Go to Finder, Applications, Ultima Underworld 1+2. Right click Ultima Underworld 2 and choose Show Package Contents. Right click Ultima Underworld 2.boxer and choose Show Package Contents.